The Great Concord Bank Robbery of 1865 New! Recreation of the robbery; photograph taken in the 1890s. Illustration from Langdon W. Moore: His Own Story of His Eventful Life. 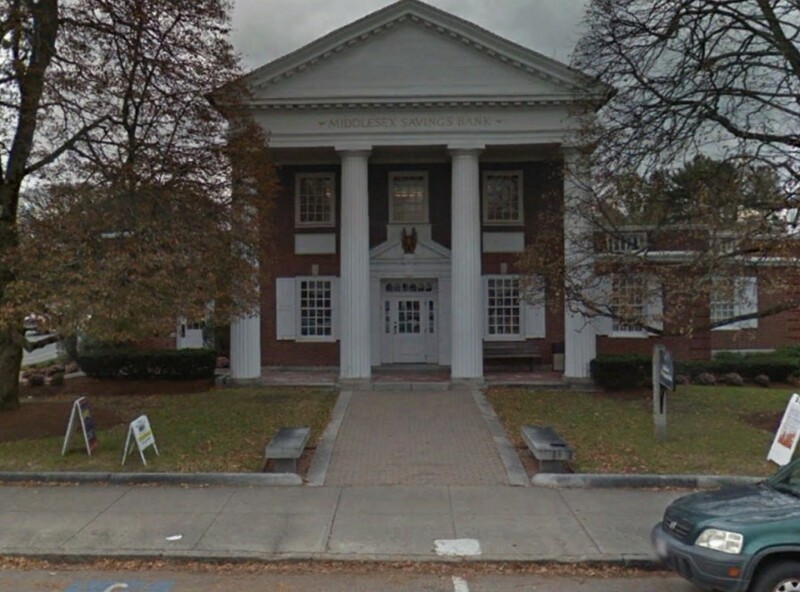 The office of Northeast Numismatics is in Concord, Massachusetts. 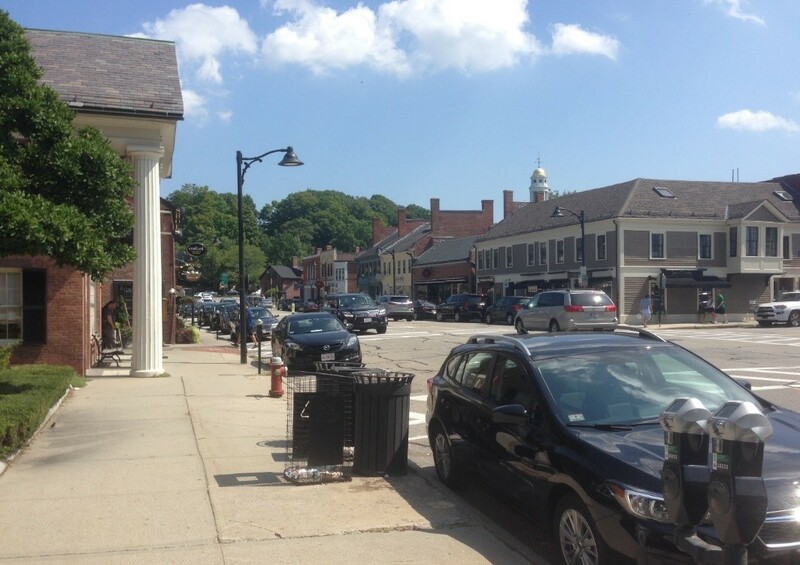 Concord has witnessed great battles, championed its revolutionary writers, and produced many famous politicians since the town was founded almost 400 years ago. Countless historians have written about the Battle of North Bridge, the town’s bold participation in the Underground Railroad, or other notable occurrences. But up until now, one fascinating story has remained lost to history for many years. 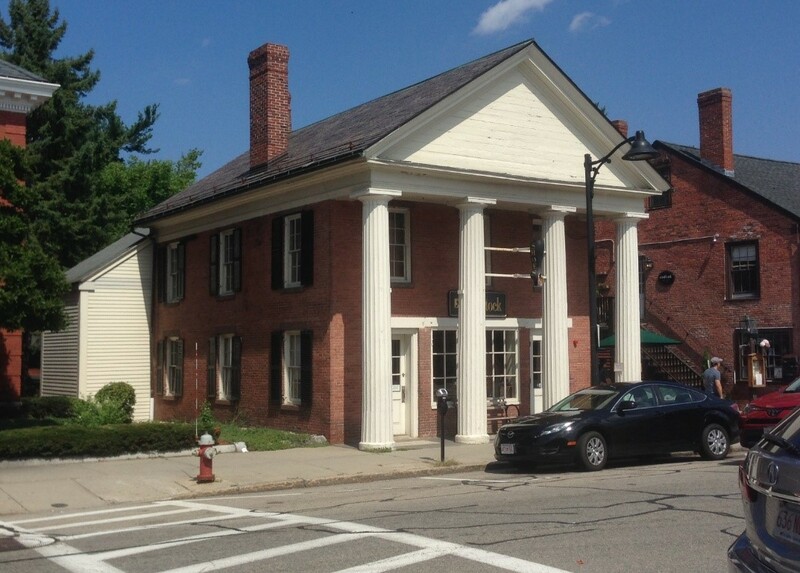 There is a small brick building with a Doric portico located in Concord Center about a block from our office. Today it is a shoe store, but most ‘Concordians’ don’t know that 153 years ago the building was the site of one of the largest and most remarkable bank robberies of 19th century America. On two o’clock of September 25th, 1865, cashier Mr. Cheshire returned to the Concord National Bank after his lunch break to discover that the safe key was missing. Immediately assuming the worst-case scenario, he closed the bank, calmly informed the town police, and telegraphed bank president George Heywood in Boston. It took six hours for Heywood, who had a second key, to return to Concord by train and unlock the safe. When he did, the group of officers and bank officials who had gathered under candlelight discovered the safe had been cleaned of the $310,000 in bonds and paper money it contained, equivalent to approximately $5 million today when adjusted for inflation. A valuable silverware set belonging to one of the churches in Concord was also missing. 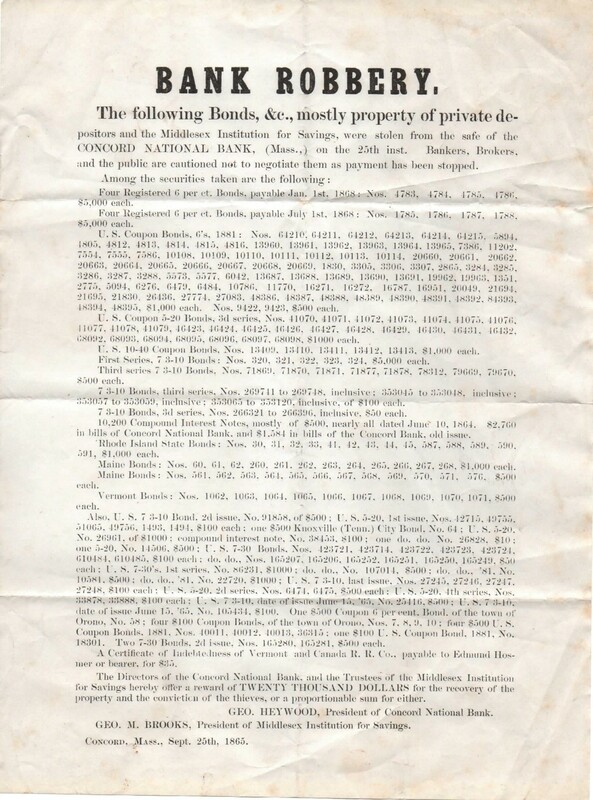 “Bank Robbery” poster printed only a few days after the robbery, listing the serial numbers of the stolen bonds and announcing a $20,000 reward for their return. Author’s collection. 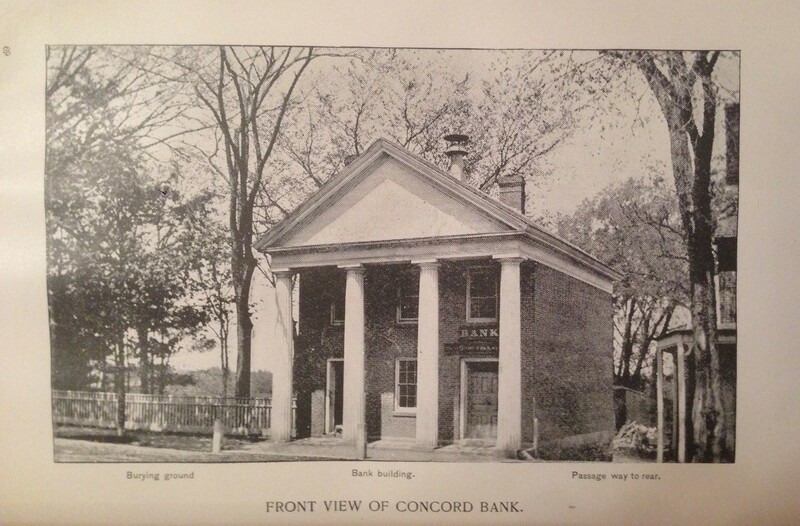 The Concord National Bank building, built in the 1830s and seen here in the 1890s. Illustration from Moore’s book. Langdon W. Moore: His Own Story of His Eventful Life. Detectives originally thought that the robbery was an inside job because none of the locks on the doors or the safe had been broken, but Heywood insisted that all his employees were loyal and above suspicion. There was only one witness. A 12-year-old girl, the cashier’s niece, visited the bank shortly after noon. She saw a stranger inside who told her the bank directors were in session and could not be disturbed. Window from the old Concord National Bank building. Currently in the Concord Museum collection. Photo courtesy of David Wood. With a $20,000 reward being offered (worth over $300,000 today), every police department in the country was hunting for a lead. After about a month of waiting, the policemen in Fitchburg made a breakthrough for the case. Charles O. Brockway, the boss of a gang of counterfeiters, was serving out his sentence in the Fitchburg Jail when he received news of the robbery. Brockway made a deal with the authorities to reveal the names of the robbers in exchange for his freedom and one thousand dollars cash, provided that the information was accurate. Brockway told the investigators that Langdon W. Moore and Harry Hunt, currently living in Framingham, had robbed the Concord National Bank. He knew it was them because he had worked with Moore and Hunt in the past, and upon learning their whereabouts, Brockway understood that their visit to the area at the time of the robbery was not a coincidence. Langdon W. Moore was tall and well-built. He always wore elegant attire and behaved like a gentleman. When people saw him, they often thought he was a wealthy merchant or retired banker. Indeed Moore was wealthy, but his true occupation was much more exciting. Moore was, at various times in his life, a gambling hall owner, a manager of a counterfeiting ring, and a professional bank robber. Unlike most criminals of his day, Moore never carried a gun, and he never intentionally robbed from the poor. He did, however, always carry at least a thousand dollars of cash on his person. Moore was born in the town of East Washington, N.H. during 1830. He spent his boyhood in Newburyport, Mass. and worked as a farmer’s assistant. When he was sixteen years old, Moore moved to Boston so he could earn higher wages. He became a cashier for various businesses, including his father’s grocery store in East Boston. After losing all his savings during his first experience gambling, Moore moved to New York City, where he made a living by playing poker in underground gambling halls. During the 1850s, a private bank could issue their own paper money if they had enough gold on hand to cover any redemptions. These banknotes circulated freely, and often one bank would accept the notes from another at full value. Moore began to meet banknote counterfeiters while gambling in New York City. These counterfeiters would print fakes of a certain bank’s issues and quickly trade them in before the authorities caught on to the fakes. Moore began working as a counterfeiter, and by the late 1850s he ran a large New York counterfeiting operation. Moore was very good at printing fakes, and he hired about a dozen people to redeem them for him. Ten-dollar Obsolete banknote from the Concord Bank in Massachusetts (would later become the Concord National Bank), 1838; obsolete notes like these were the type that Moore and his partners counterfeited. Several thousand dollars of them were stolen in the robbery. Tom Caldwell’s collection. 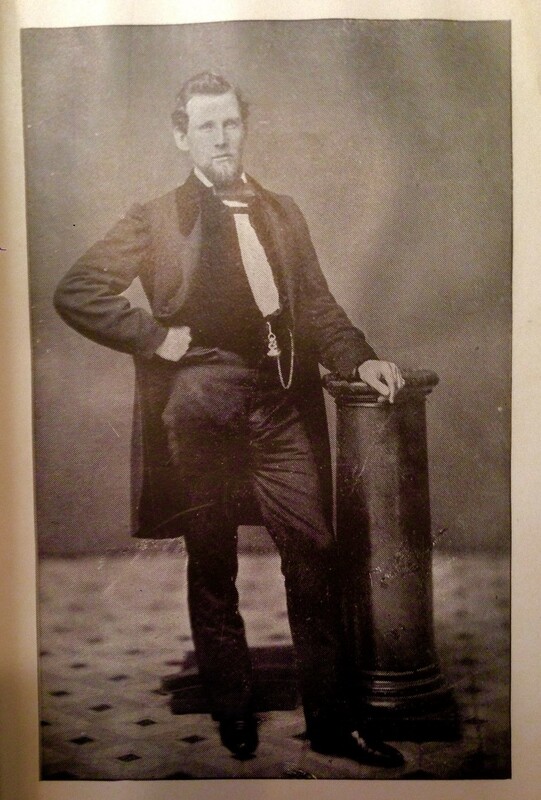 Moore made a lot of money from his illegal activities, but one of his closest accomplices was arrested in late 1864, and the police were close on his trail. That was when Moore decided to sell the gambling house he had been operating, abandon his counterfeiting venture, and buy a farm in Natick, Mass. until things cooled down in New York. He brought several of his cronies from New York with him, who, being total strangers to the local police, successfully posed as farmhands. 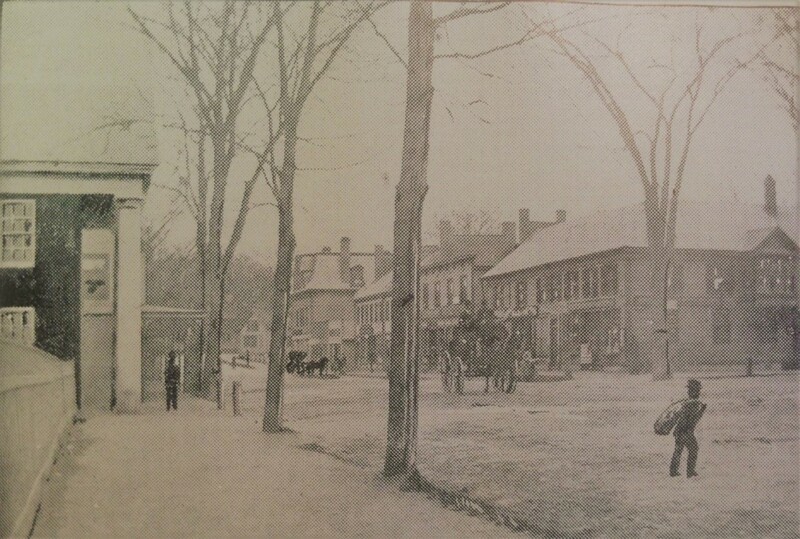 With nothing to do in Natick during March of 1865, Moore planned to rob a bank. He taught himself how to pick locks and practiced breaking into a safe that he had purchased. Moore originally planned to rob a bank in Francestown, NH, but he decided not to because he knew some people who lived nearby. 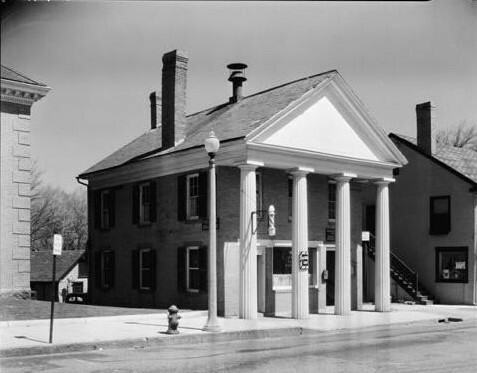 On the way back home from Francestown, Moore stopped for lunch in Concord and visited Concord National Bank. There, he exchanged a $100 note for twenties, carefully observing the cashier as he unlocked the front and inner doors of the safe to make change. It was an older model from the 1830s that Moore knew how to break into. Moore had found his bank; he partnered with an Englishman named Harry Hunt, an expert safe cracker and lock picker, and they began planning the robbery. 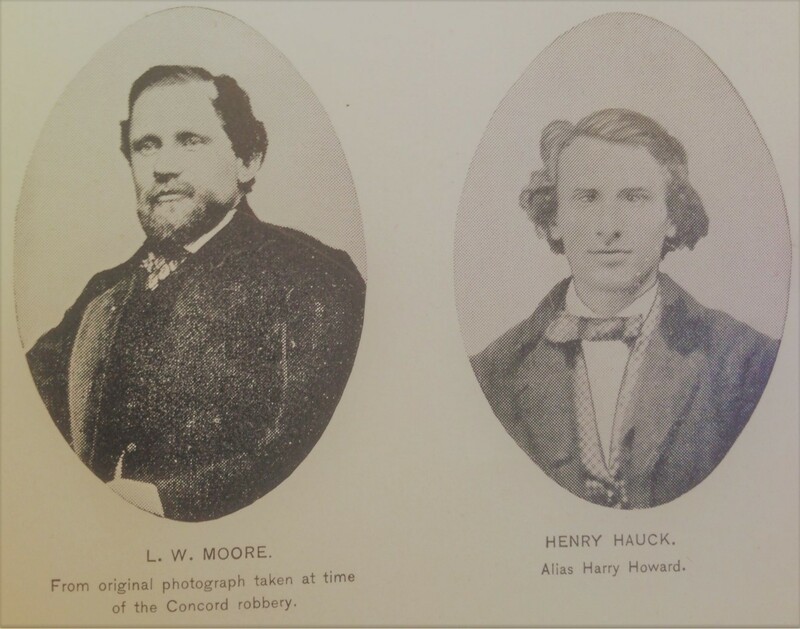 Photographs of Langdon Moore and Harry Hunt around the time of the robbery; illustration from Moore’s book. 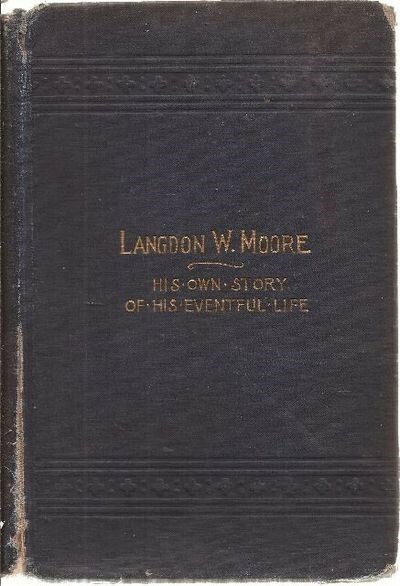 Langdon W. Moore: His Own Story of His Eventful Life. The two men visited Concord late the next night, watching the bank and taking note of any movement that occurred in town. This was the first of many times when they returned in the dead of night. They started by creating a mold of the lock on the front door. Next, they made a mold of the lock on the bank’s second door, and then they began with the ten locks on the outer and inner doors of the safe. Night after night, they would secretly visit the bank, enter it, and laboriously mold the locks. The visits got so regular that Moore and Hunt began to store tools behind the very vault they were robbing. They had several close calls, including one time when a chamber pot was emptied on Moore in the alley next to the bank and another when Moore accidently dented the front door. The damaged door would have surely alerted the cashier if Moore had not wedged the pieces of wood back into place. However, despite some close calls, their daring persistence paid off. After five weeks of nightly visits, Moore and Hunt had a complete set of keys for the bank, and the two burglars could steal the contents of the vault whenever they wished. Moore waited to make his move until the afternoon of September 25th, when he knew the bank would receive a large delivery of bonds worth $75,000. Hunt sat across Main St. in a stagecoach while Moore strolled through the graveyard next to the bank, pretending to read the epitaphs on the headstones. Once the cashier closed the bank for lunch and walked home, Moore used his set of keys to enter the front door. He proceeded to unlock the second door and the vault doors with ease. Aside from the incident with the cashier’s niece, the robbery went smoothly. Nobody noticed the formally dressed man wearing a top hat low over his face as he casually walked away from the bank with an old burlap farm bag over his shoulder. Moore lighted a cigar, strolled down to where Hunt was waiting for him, tossed the bag into the back of the stagecoach, and said, “All right, Henry. I guess we can go home now.” Everything had gone according to plan. Back at the farm, Moore sold the carriage and shot the team of horses that had been used in the escape, thus hiding all evidence of the robbery. He even prepared an alibi in case the police caught on. Right after he returned from the robbery, Moore sent for a doctor. The doctor came, observed Moore (who was genuinely sick at the time), and prescribed him some fever medicine. 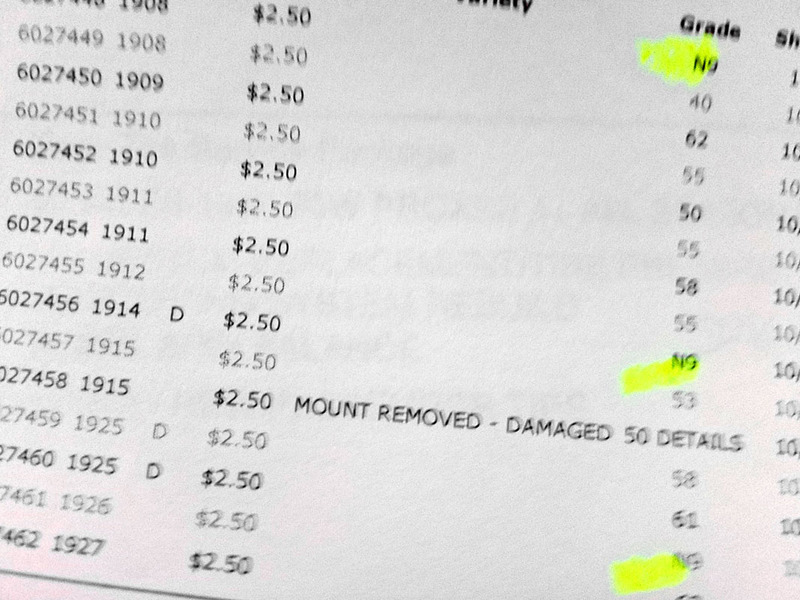 Moore began to laboriously edit the serial numbers on the bonds so they could be redeemed. He gave Hunt his 1/3rd cut of $103,000, who subsequently departed. The police were quick to pursue the lead Brockway had given them. They were delayed in obtaining a search warrant for Moore’s farm in Framingham, but investigators surrounded it anyway, discreetly examining Moore’s every movement. After spotting a policeman hiding in the woods, Moore quickly sold the farm to his brother and left for New York to avoid arrest. However, the New York Police Department began spying on his apartment and following him through the streets. Another one of Moore’s accomplices turned on him, and the New York police had enough evidence to bring him in. Moore left New York and purchased a farm in Paulsboro, New Jersey (ten miles south of Philadelphia) to escape arrest once again. There, he hid the stolen bonds under a pile of manure in the barn. On January 23, 1866, five months after the robbery, Moore was peaceably arrested by the New York Police Department at his farm in New Jersey. The detectives thoroughly searched his property for the stolen money, but in an act of astonishing good fortune for Moore, they failed to locate the hidden sack of bills. A few days later, several bank officials from Concord made the train ride down to New York to negotiate with Moore. With all the money still missing, they were left with no other option but to agree not to press charges if Moore returned the funds. The $203,000 in securities was repaid, and Moore never had to serve a day in prison. The stolen set of silverware was also returned to the Concord minister, and Moore claimed that had he known whom it belonged to, he never would have taken it. Langdon Moore would continue to lead a life of crime for another thirty years, robbing banks and stealing valuables. The Concord robbery cemented his reputation as a highly skilled burglar. He served out two sentences for other crimes, one of which was coincidentally served at the Concord State Prison about three miles from Concord Center. As an elderly gentleman in the 1890s, Moore reformed from any illegal activities, wrote a 650-page autobiography describing his exciting life of crime, and began giving lectures. He dedicated three chapters to the Concord National Bank robbery, the first and largest of the many bank robberies that he committed. These chapters have proven to be an invaluable resource for me in retelling his story. On a side note, Moore was a coin collector. While I was unable to discover any details about the coins he had, Moore says in his book that he owned “$100 face value in rare old coins” at the time of the Concord robbery. Moore lived out his days in New Jersey, where he passed away in 1910 at the age of 80. Although he was quite well known during his lifetime, Moore’s story is all but forgotten today. Moore’s 650-page autobiography and a portrait of him taken at the time of publishing in 1892. Author’s collection. As for the English safe-cracker Harry Hunt, we will never know his fate. He split from Moore after the bank robbery. One Boston newspaper hypothesized that Hunt took a steamer to Germany, were he could have sold the bonds without being caught. Alternatively, he might have returned to his native England or perhaps traveled north to Canada. None of his $103,000 share was ever recovered, but neither the Concord National nor the Middlesex Institution for Savings folded from the loss. 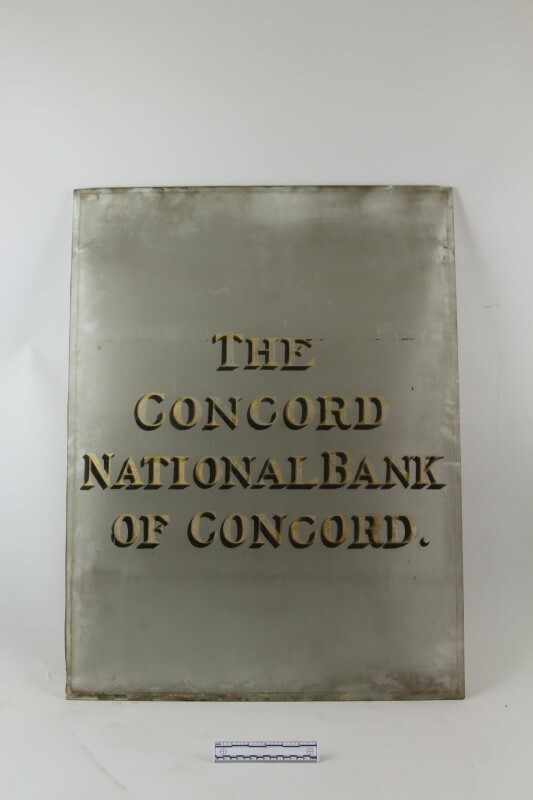 The Concord National Bank thrived under the leadership of President George Heywood after the robbery, and his son, Charles Fay Heywood, expanded the bank in 1915 by building a larger and more modern structure next-door at 52 Main St. (today a Bank of America branch). 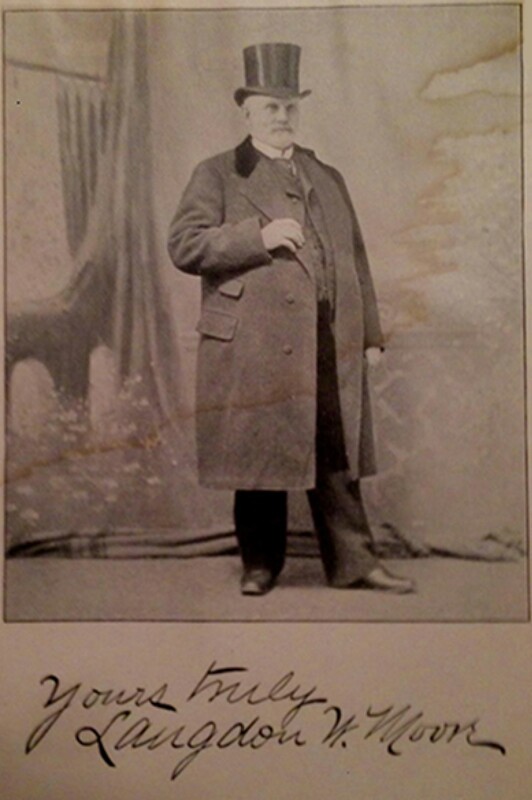 George M. Brooks, the president of the Middlesex Institution for Savings, was elected to the U.S. House of Representatives in 1869. He resigned in 1872 and served as judge of probate in Middlesex County until his death in 1893. 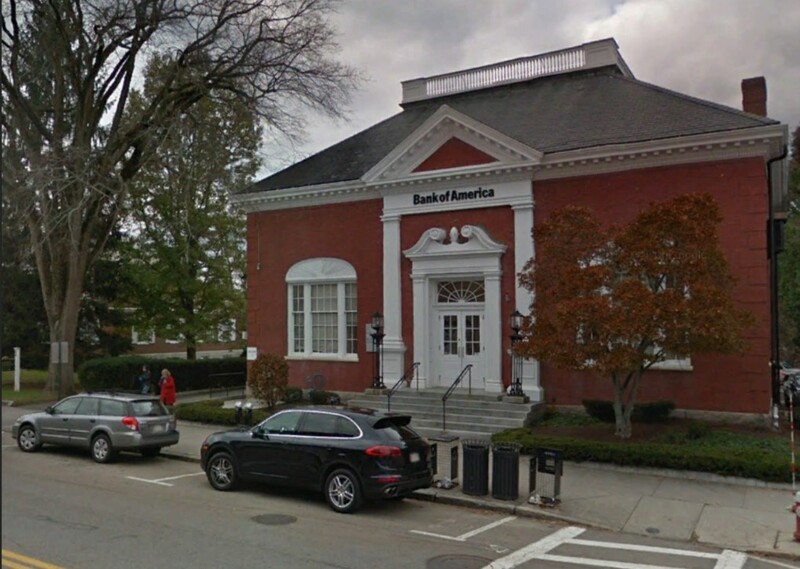 Unhindered by the robbery, The Middlesex Institution for Savings would grow out from its single location in Concord to become Middlesex Savings Bank, and it currently operates 22 branches across the county. 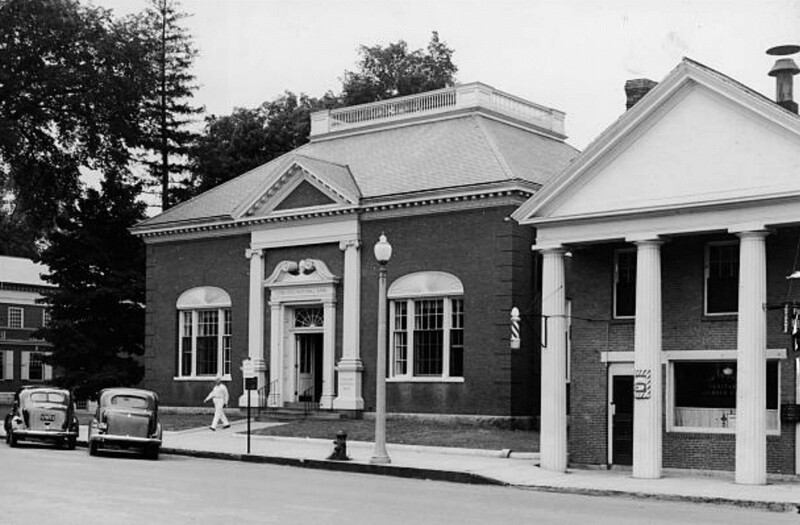 The second Concord National Bank building in the early 1930s, today a Bank of America branch. The old bank building on the right became a barber shop. Ten-dollar Concord National Bank note, early 1930s; notice the signature of C. Fay Heywood as cashier. Author’s collection. While the clothing, cars, and businesses have changed in Concord center over the past 100 years, many of our buildings have remained the same. Main St., looking East, during the 1890s vs. today. The second Concord National Bank building in the 1930s vs. today. 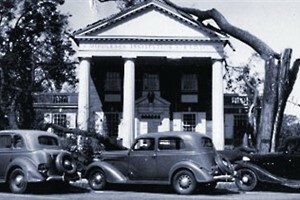 The second Middlesex Institution for Savings building in Concord, shortly after the Hurricane of 1938 vs. today. The old Concord National Bank building as a barber shop in the 1930s vs. a shoe store today. This was a great post and a fine distraction. The primary reason I collect coins is for the history they represent. You've brought an era to life when America was still young and even localized it. Thank you for the post. Looking forward too others! A Fifteen Cent Acquisition New! We recently purchased not one, not two, but three 1792 Half Dismes! This is one of the most exciting offerings we have had in in very long time. All three came from a collection purchased in southern California on a recent buying trip. We had been aware of these three pieces for over 20 years and our long-time client finally decided to let them go. Historically, it does not get any better than the origins of these rarities. As George Washington noted, “There has been a small beginning in the coinage of Half Dismes.” This was said in his fourth annual address to Congress on November 6, 1792. Earlier, Thomas Jefferson had recorded the striking on July 13, 1792, mentioning “1,500 Half Dismes have been delivered”. Deeply steeped in coin lore, it has been said that the silver to mint these pieces were from Martha Washington’s silverware. Even though this story has since been discounted, you would be hard pressed to find any coin that is more connected to our nation’s origins. Most of these Half Dismes have been long lost or destroyed, with fewer than 300 known to exist today. A very small number are known to exist in high grade. Low grade damaged pieces are sometimes encountered. What made our acquisition most delightful is that the coins are nice quality, mid-grade circulated specimens with no problems. Graded decades ago, they are residing in old green PCGS holders. We now just have one of these left, which can you view here. Oh, from this same collection we also acquired three 1796 Small Eagle Draped Bust Quarters as well as a 1796 Small Eagle Draped Bust Half Dollar. Such a stunning coin. Wondered if you had your own "wish list" of coins you'd like to list that you haven't handled before? 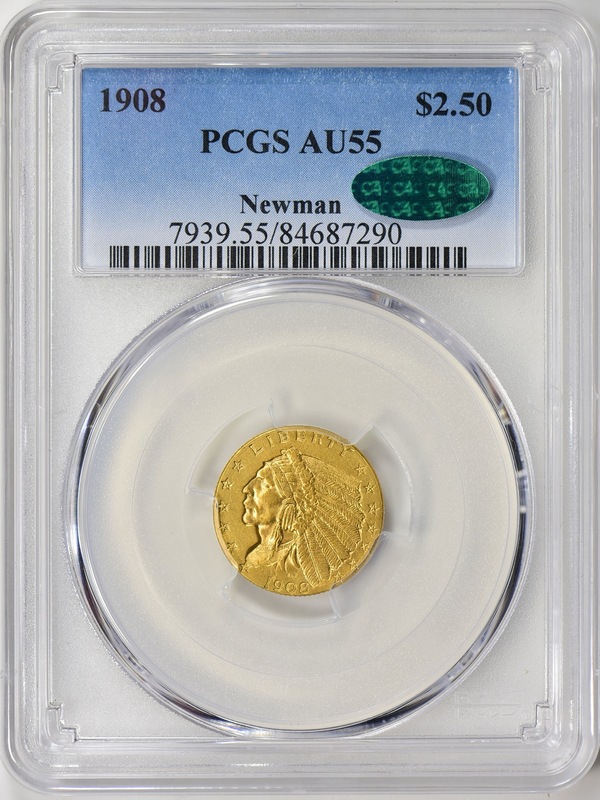 Buying graded vs. ungraded coins New! The following is a guest post written by Jody from Washington. I am not a professional numismatist, rather a student of money and part time collector. 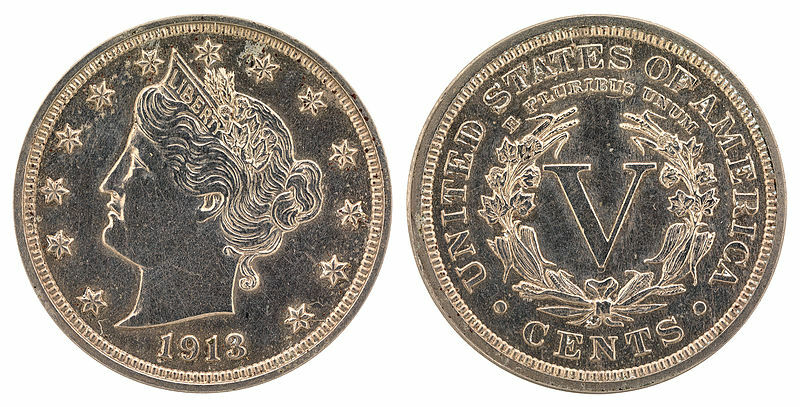 Growing up I was intrigued by coins as my father would often talk about his assemblage. I never had much of a collection until a couple of years ago when I walked into my local coin shop looking to invest in silver eagles. I asked a lot of questions but to be honest, a lot of it went over my head. 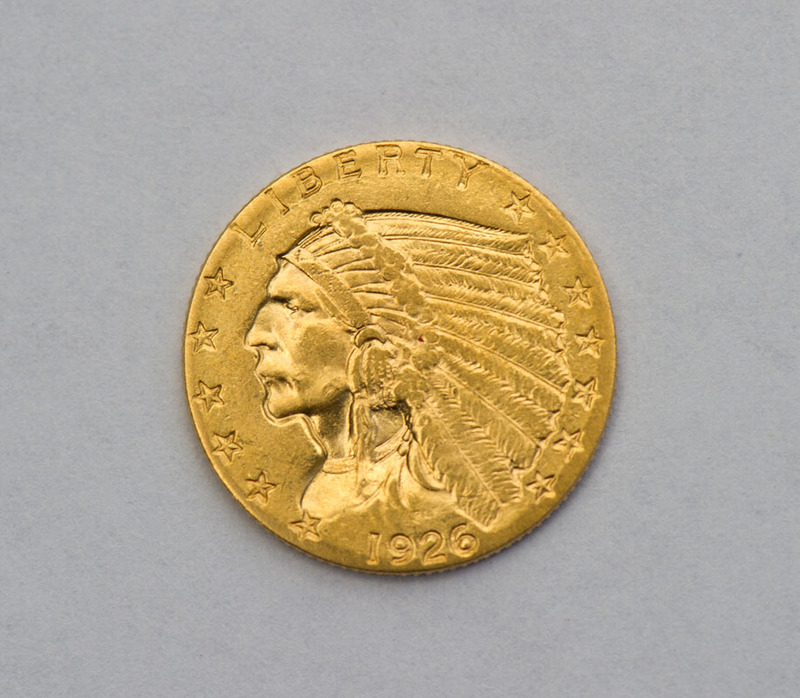 The coin shop owner showed me a raw gold Half Eagle Indian, which he said was cleaned and thus would sell to me for melt value. That day would forever change me as I would become fixated with quarter and half Eagle Indians. The design alone was intriguing as was the idea of something old and then there was the gold. I dove head first collecting Indian Quarter Eagles since it only consists of 15 coins with one key date. Like many before me, I turned to eBay as a source. I began searching and buying raw specimens that looked good on the screen. I bought from trusted dealers with good feedback and took their word for grade, as I had no idea what to look for. After a few months of buying on eBay and local shows, I succeeded in completing the set with the exception of the key date, which is the 1911-D. I decided to step up my game and traveled to the Long Beach Expo. As you can imagine, I was instantly overwhelmed with the sheer size of the show, but at the same time I was excited to begin the hunt for my key date. It was at this show that I would deepen my knowledge from so many folks willing to share their wisdom and years of expertise. It was also the first time I started to question my own purchases. I found many dealers only dealing in graded coins, which made me wonder if my collection was lacking long-term value. In addition, I found very few raw coins, at least of the gold Indian variety. I was only at the show for one day. With limited time I began to look for an education rather than coins. That is when I met fellow Indian collector and Indian expert Allan Schein who authored the book, “The Gold Indians of Bela Lyon Pratt.” Allan not only educated me, he point blank told me I needed to be buying the highest graded coin I could afford, he also explained the epidemic and ever increasing market of counterfeit coins. In my mind I thought for sure I was sitting pretty safe with my collection as I had bought them from legitimate dealers, albeit via eBay. I headed to the ANACS booth as they did not require a membership for grading and my main goal was see where I stood with my collection. I submitted twenty gold Indians, which was scary for a first timer. This was my collection and I am handing it over to a complete stranger. Oh well, it must be legit right? Four pain staking weeks later, the package finally arrived from ANACS, and I could hardly wait to see the results. Upon opening the sealed box, I first read the grading sheet summary. Looking down the list of grades, MS61, AU50, AU58, N9, N9, N9…. Um what is N9? It didn’t explain what N9 was and I noticed several coins in the box were ungraded. I called ANACS and I couldn’t believe my ears. COUNTERFEIT! That’s right, I had 6 counterfeit coins, all of which were common dates and the majority were AU or worse. I was mortified and felt taken advantage of, but at the same time I felt relieved to learn this valuable lesson so early on in my collecting adventures rather than 20 years down the road. A lesson hard learned. Today, the vast majority of my purchases are graded by NGC or PCGS and I sleep well knowing my coins are legitimate and what they are valued at. I also feel assured in knowing that some day my children will have no question what they are as well. I learned that utilizing expert graders takes a lot of the long-term risk out of owning and selling coins. I still occasionally buy raw coins, but only in-person and after careful consideration, they will ultimately end up being graded. As for the counterfeit coins, I was able to get my money back on all of them. You can imagine some of the dealers were just as shocked as I was. I enjoyed reading your comments. I too am apprehensive about turning over my Morgan set for 3rd party grading. Not because I don't trust them, but because I don't want to find out some of my collection includes cleaned or counterfeit coins! After many years, I completed my Morgan set, year, mint mark and key varieties and about 1/2 are "raw" having started this collection when I was young and cash was tight. I think you've inspired me to submit the set so there is not confusion. Best of luck and thanks for your post. The moral of the story: generally stay away from raw coins. And never, absolutely never, buy raw coins on ebay. Why so many do completely baffles me. I honestly just don't get it. I enjoyed this post, as I enjoy all the posts here. And I greatly sympathize with the author. I knew exactly where they were headed, almost from the very beginning. There's no question they learned a valuable lesson. Come See Northeast at Gillette Stadium New! Tom and Brian from our office will be setting up shop at the 2018 Best Years Expo at Gillette Stadium in Foxboro, Massachusetts. Home to the five time Super Bowl Champion New England Patriots, Gillette will host The Best Years Expo on October 20th. The Best Years Expo provides attendees with a host of options to help them celebrate, learn, and experience life in their 50s, 60s, 70s, and beyond. Close to 50 vendors will be in attendance. Guests will enjoy a day of celebrity appearances, seminars, vendors, activities, giveaways, and more! So to our New England customers, come on down to the stadium and see us. We encourage you to bring any coins you might like to sell. Hope to see you there! Lifetime Numismatic Goal Achieved! New! We have a wonderful customer named Paul from right here in Massachussetts that we have been doing business with for the last couple of years. Paul is 92 and is a spry, fiery sort. We all enjoy his conversation and enthusiasm for life and his coins. 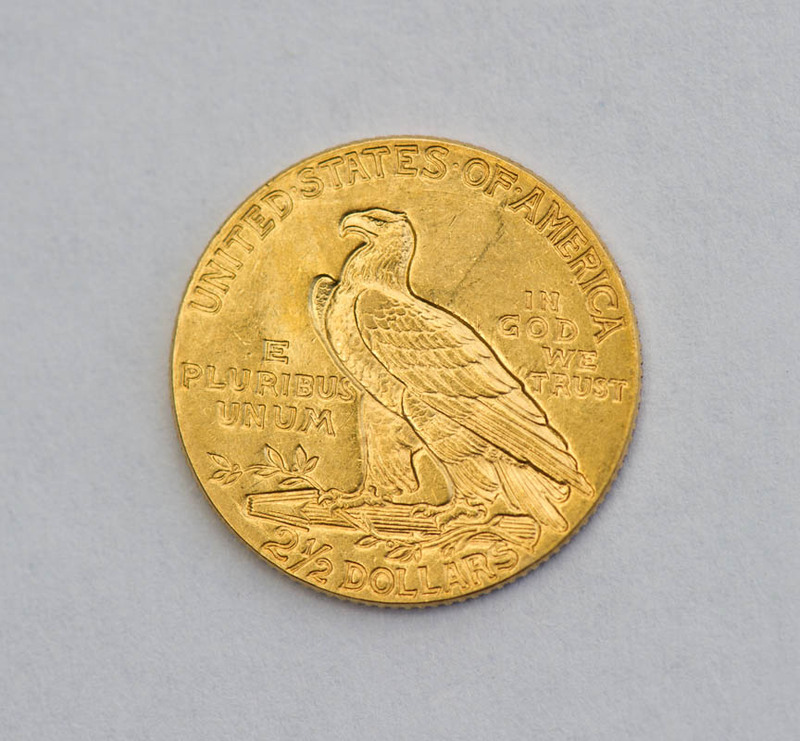 Paul has been collecting for just shy of 75 years and has built an impressive collection of Flying Eagle Cents, Lincolns, Mercury Dimes, and Walkers (among other types). In fact, Paul recently completed his Walking Liberty Half Dollar set with us. A few months ago after purchasing a 1942/41-D Mercury Dime from us, he proudly mentioned that he now needed only one coin to complete the set - the key date 1916-D. We did have one at the time, but unfortunately for Paul it was mint state and a bit outside the range with which he was comfortable paying. He asked if we could try and locate one in Fine condition. With that, we added Paul's wish to our want list and sure enough, Tom from our office found just such a coin. I called Paul and he said he hadn't been feeling so good lately, although he did seem to perk up when I gave him the news that we had located a 1916-D Mercury Dime NGC F12. Paul said that if he "makes it through the night" then he will call us tomorrow. Sure enough we got a call the next morning. Paul was feeling much better and was ready to buy the coin and finally complete his set. He sounded like he was beaming at the prospect of finally reaching this life-long numismatic goal. Congratulations to Paul! We all like happy ending stories like this one, but remember - you don't have to be 92 and on your last coin in order to give us your want list. Perhaps we can make it happen for you whether you're just starting out or just finishing up your collection. Email us at info@northeastcoin.com or give us a call at 800.449.2646 and let us know how we can help you.